Comedian Stephen Colbert has urged viewers of "The Colbert Report" on Comedy Central to write-in his name for NASA's naming contest regarding a new space station module. NASA is poisedto launch a new treadmill named for comedian Stephen Colbert to theInternational Space Station on the shuttle Discovery on Tuesday and at leastone astronaut has taken it for a test spin. But what's it like, running inspace? AstronautSunita Williams, who lived aboard the space station for almost seven months in2007, ran a marathon in space during her trip, making her an expert of sorts onjoggingin orbit. "I trieda COLBERTmockup at Johnson Space Center," Williams has said, adding that thetreadmill is broader than one on the station today. "So you don't have towatch out where your feet go. It allows a wider, more natural gait." Still, it?sa strange experience, one in which sweat floats and your feet might, too. The newtreadmill will launch alongside 15,200 pounds (6,894 kg) of new science gearand supplies. It will complement the space station's array of exerciseequipment that helps astronauts fight the bone loss and muscle decay associatedwith space travel. Discoveryis slatedto launch Tuesday at 1:36 a.m. EDT (0536 GMT) from NASA?s Kennedy SpaceCenter in Florida to begin a 13-day mission to the International Space Station. Colbert'sname on the new machine is a consolation prize to the host of Comedy Central's"The Colbert Report" after his fans won aNASA poll to name the newest space station module earlier this year. Voterschose "Colbert" for the module, but NASA opted for the more staidmoniker "Tranquility," reserving "Colbert" for thetreadmill. With bureaucraticflair, NASA managed to convert the name "Colbert" into a complexacronym: the device is officially titled the Combined Operational Load BearingExternal Resistance Treadmill - C.O.L.B.E.R.T. Discoverycommander Rick Sturckow said that he and his crew don?t plan to do much morethan deliver the treadmill, but he recognizes the popularity Colbert?s name mayadd to it, even if it came out of an online poll originally reserved for a newstation room. ?I think it?simportant to broaden NASA?s reach and pick up other audiences,? Sturckow saidin a recent interview. ?So if they want to have a contest to try and namesomething and that works into something else, and it wasn?t what it wasinitially started out to be?I still think that it?s a net gain for NASA.? NASAinvited Colbert to watch Discovery launch his namesake into space, but he wasunable to attend. Instead, NASA will broadcast a television message fromColbert tonight on NASA TV. 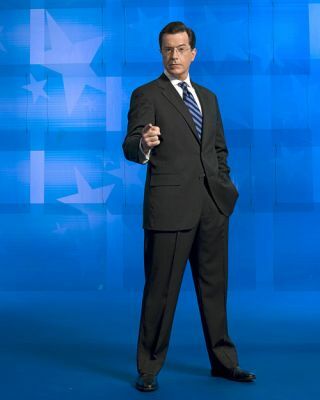 COLBERT will be the secondtreadmill for the station's six-member crew. The one in place now, called theTreadmill with Vibration Isolation System - TVIS, allows astronauts to runwithout vibrating delicate microgravity science experiments in adjacent labs. "Justgetting ready to run is a workout when you're weightless,? Williams said. ?Beforeall my training runs up there, I had to hook the toes of one foot under ahandrail to keep from floating around while I struggled to put my sock and shoeon my other foot." The astronauts also have asimple solution to keeping their feet firmly planted while running in zerogravity: bungee cords. "You have to strap yourself to the treadmill,"Williams said. In 2007,Williams effectively ranthe Boston Marathon on the space station's treadmill, wrapping herself inbungee cords for the 26.2-mile race. She missed the cheering crowds. "Inspace it's a little bit lonely," she said. But her crewmates rooted forher and floated slices of oranges to her while she ran. Inside theclose, still quarters of the space station, there are also no gentle breezes. "Sweat globs onto you.It doesn't evaporate," Williams said. "I was soaking wet. During themarathon my hair was so sopping it flopped right in my face. We have littlefans blowing on us but they don't do much good." She recovered faster afterthe space marathon than she did after running on Earth. "When you'refloating, your muscles get to rest, so you can totally relax when you finishrunning - it's like being in a pool," she said. But afterward she did notfeel the "endorphin effect," or runner's high that long-distanceefforts can provide. "I'm not sure why," she said. "We areloaded with only about 60 percent of our Earth weight on TVIS and its harnesssystem, so maybe I just didn't work hard enough." After the run, Williamslonged for a hot shower. "A sponge bath just isn't the same!" shesaid. Neither did she have a washer and dryer for cleaning her sweat-soakedrunning clothes. "I hung my drenched clothes near a fan and tied mysneakers to a handrail to air them out." SPACE.comwill provide complete coverage of Discovery's STS-128 mission to theInternational Space Station with Managing Editor Tariq Malik and Staff WriterClara Moskowitz. Click herefor shuttle mission updates and a link to NASA TV.